While everyone enjoys videogames for different reasons, we all have one thing in common: we love to play them. When thinking about this week’s Memory Card, the word “play” kept popping up in my mind. Playing videogames. Are we, as gamers, enjoying videogames because of the stuff that is happening on the screen, or because of the actual act of playing? 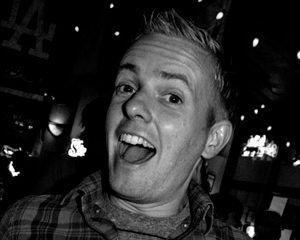 Is picking up a controller and pushing buttons an enjoyable activity? If a videogame sequence had no specific goal, would you still be interested in playing it? I know my answer to that last question is a resounding yes based solely on my experience with one game: Super Mario 64 for the Nintendo 64. Although it may seem simple -- even insignificant to some -- let's relive one of the most important and meaningful moments in videogame history. A moment that proves how much fun playing a videogame can be. It goes without saying that Super Mario 64 is a revolutionary game as it inspired countless videogames that came after it. Even after all these years, the Nintendo 64 masterpiece remains one of the greatest 3D platformers ever made. 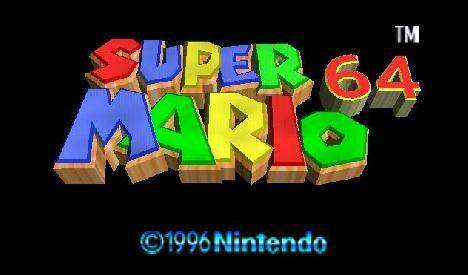 Like all the Mario games that came before it, Super Mario 64 is not known for its amazing story. 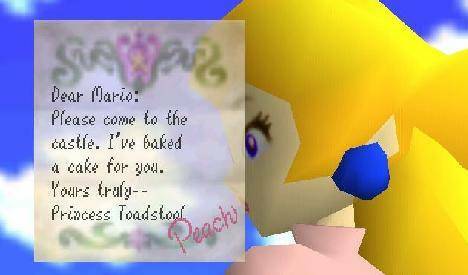 In the game, Princess Peach invites Mario to her castle to enjoy a cake she baked for him. After arriving to claim the tasty dessert, Mario discovers that Bowser has kidnapped Peach and taken her to the top of the castle’s highest tower. Yeah, that’s basically it. What the game lacks in story, however, it makes up for in amazing gameplay. But I am getting ahead of myself. To understand how much this game means to me -- and to explain what makes this week’s moment so special -- it helps to get a little background on where my love affair with this game began. 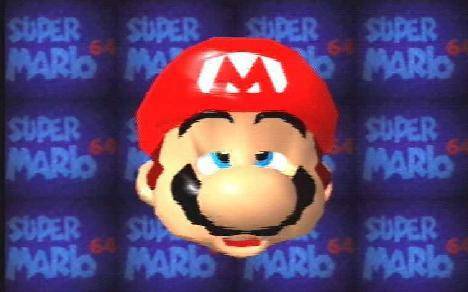 I will never forget the first time I ever heard of Super Mario 64. I saw a blurry screenshot of the game in an issue of Electronic Gaming Monthly. I was 19. And, yes, that makes me very old. Coming off the Super Nintendo (my favorite console of all time), I was excited about the Nintendo 64. Having only heard news of technical specs, seeing images of some of the first games for the system blew my mind. Taking graphics in a whole new direction, the N64 games were in (gasp!) 3D! It was the future! While the screenshots impressed me, it wasn’t until I actually got my hands on the system when I realized videogames were officially changed forever. It seems to be the norm now, but before Super Mario 64 launched with the Nintendo 64, some companies -- in particular, Toys R Us -- decided to put the game out on the floor and let people play it. Not only did they do this with Super Mario 64, but, strangely enough, the entire game was available, with no time limit or set amount of levels imposed on the player. 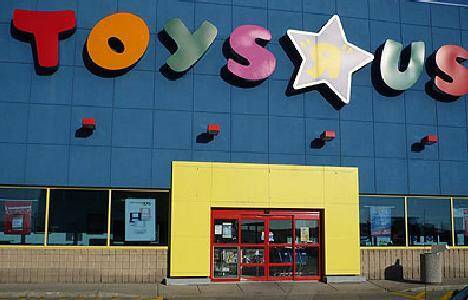 Even though I was a college student, I used to trek over to Toys R Us every single day to play the game. Every day. If I was lucky, I would find the console station empty, allowing me to play the game as long as I liked. In one play session alone, I think I managed to get all the way up to Big Boo's Haunt. If you know the game, you know that is pretty far to get, especially while uncomfortably standing under some cancer-inducing fluorescent lights. So what kept me coming back so much? Why was I so obsessed with the Nintendo 64 and Super Mario 64? The answer lies in the next Memory Card moment: running outside the castle. Up to this point, I had never in my entire life played a videogame just to play it. By this, I mean that never in my life had I turned on a game with no other purpose then to aimlessly walk around with no set goal. Even with the first Super Mario Bros. -- as amazing as it is -- I played that game to beat the levels; I never just ran back and forth on the opening screen for no reason. This all changed with Super Mario 64. After hitting start, the game begins with Princess Peach reading her letter to Mario (wow, voice acting in a Mario game!). When the letter is complete, it fades away, leaving a bright blue sky in the background. Suddenly, a Lakitu floats into frame on his familiar cloud. Instead of carrying a Spiny, though, Lakitu is carrying what looks like a video camera (?). At this point, Lakitu flies off into the distance as the camera pulls back. After revealing Peach’s castle in its full three-dimensional glory, the view shifts to a close-up of the path leading up to the magnificent castle. Accompanied by the classic sound effect, a warp pipe emerges from the path. 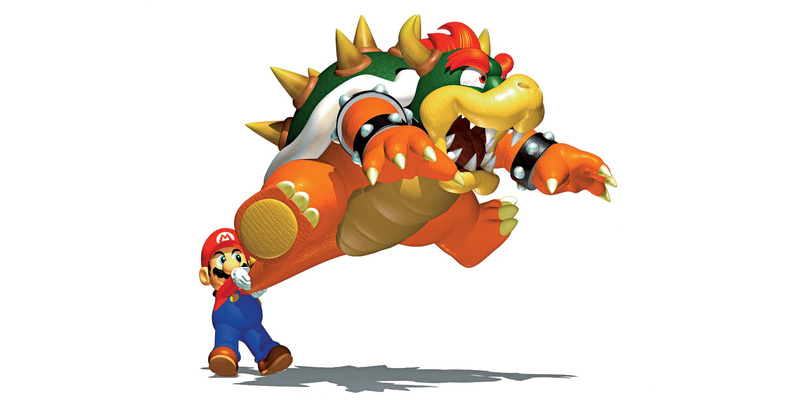 From its interior, Mario jumps out and lands on the ground. Before he even finds out that Peach has been kidnapped, the game offers the castle’s garden as a veritable playground to get the player used to the brand-new analog stick controls. The garden is moderately large and covered in green grass, stone walkways, small trees, a water-filled moat, and rolling hills. Once Mario jumps out of the warp pipe (and after a quick word from Lakitu) the player has full control. Before entering the castle, Mario can go anywhere he wants: He can swim in the moat, climb a tree, practice some of his amazing flips. The first time I experienced this, I was blown away. I remember seeing a small tree at the far end of the garden and thinking to myself, I can actually walk there. And I would. Over and over again. Although it had nothing to do with progressing the story in any way, I would run around for, literally, hours in the garden -- just for the fun of it. Running outside the castle for the first time was, in a word, inspiring. This week’s Memory Card is not a normal videogame moment like most people expect from this feature. In fact, nothing significant really happens at all -- there is no dramatic story twist or surprising character development. But that doesn’t make Mario running outside the castle any less important. For starters, the garden area around the castle is designed perfectly, containing the right amount of tress, hills, water, and space to help the player get acclimated to the controls. A lot of us “retro” people complain about the overabundance of forced tutorials in videogames nowadays. This opening section doesn’t really force anything on you at all. True, there are a couple times Lakitu will inform the player how to control the camera and stuff, but that is more out of necessity and unfamiliarity than anything else. 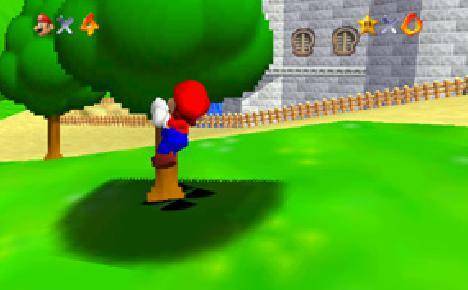 Instead of forcing the player to participate in a tutorial level, Super Mario 64 just lets you run around in the garden and have fun. You can jump on a tree and learn to climb it yourself; you can dive in the moat and figure out how to swim. Think about it: this is the first time the world had even touched analog controls. Of all games to have a tutorial in it, this would be the one. But, no -- the designers trust the intuitive nature of the 3D controls to let the player just familiarize themselves with them at their own speed. It’s a gutsy move, but works perfectly. How much less memorable would experiencing Mario in 3D for the very first time be if the opening level was bogged down in constant tutorial messages and dialogue? I think the answer is obvious. 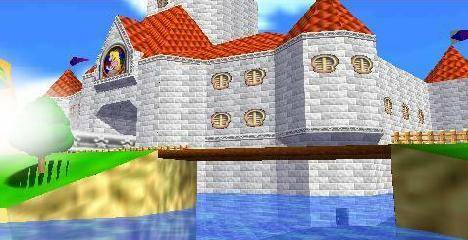 Like the first time there was sound in film (“You ain’t heard nothing yet!”), the garden scene in front of the castle in Super Mario 64 single-handedly started a new era in videogames. Looking back, it is a pretty incredible and significant milestone. Funny enough, I don’t think I ran around a videogame for hours with no other goal until the recent Super Mario Galaxy, the true spiritual successor to Super Mario 64. Not to talk about that game too much, but there is a level with these floating, flat(ish) metal plates. By performing a long jump, Mario can flip to the underside of them in this long arc, almost floating out into space until gravity takes over and the agile plumber is pulled back to solid ground. 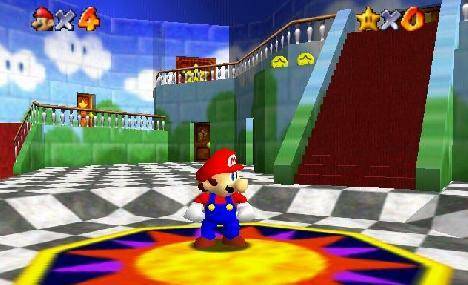 Like Super Mario 64, the experience is hypnotizing; it’s remarkably simple, yet endlessly rewarding and hopelessly addictive. I don’t know if I will ever experience another videogame in my lifetime that fills me with the same wonder that Super Mario 64 did for the first time. I hope there is, but the feeling produced from the combination of my age and the introduction of a fluid, 3D videogame for the first time (with one of my favorite characters) may never come along again. Because of this, I look back at this wonderful memory with a nostalgic smile on my face. 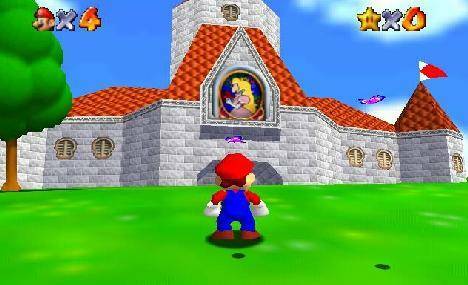 Running around the castle in Super Mario 64 is an iconic moment in my videogame life and one that I will never forget as long as I live. There will always be a special place in my heart for this moment -- one that reminds me that, above all else, playing videogames is all about having fun.